The good life has hit a pot hole which I am not inclined to BS about at the moment. There will be time for that later but know I woke up today momentarily inclined to once again ratchet up my game. If all goes well I will be facing two or three months of stay at home 24 hour fussing. Please God let all go well and forgive me my agnosticism if that’s an impediment and By God! if it is that’s both our problem. I decided it was time start in on my office reorganization. I was thinking of all the things I wanted to write……largely books instead of blog posts……and how I really needed to make my stuff accessible and get it off my floor. Clutter keeps me out of the office. I’ve become allergic to it in my dotage as it only adds to my confusion. But, as you can clearly read, I’ve stopped to pontificate on the blog so here’s what I have to get off my chest to proceed to the organizing. Write a letter to a friend, get blogging out of my system for the rest of the day and clean up my room. Before that began I crawled out of my bed at 4. Spent an hour denying my morning cat food until I had folded the sheets from last night’s laundry, put the clean dishes away, pulled my Duluth Trib out of the back door and quickly peruse it and take my woman’s vitamin. First digression. I got my dalmatian done on Thursday – my 101st blood donation. (See 100 pints.) For years I was given a pass after a pin prick to my middle fingers to test my hemoglobin. Had I not had sufficient iron in my blood I would not have been permitted to donate that day. A year ago they raised the requirement from a 12 something, which I always had managed, to a 13 something. Suddenly I was barely making it. One month I didn’t make it but a nurse suggested I squeeze my fingers to get fresher more ironic blood to my finger tips. That worked. But the next time I came in I wasn’t given the option. I had to turn around and go home. I made it up later after eating hamburgers…..not that this is what helped. My wife suggested vitamins and went out to buy some for me. The only bottles that had iron in them were women’s viatimins…….for that time of the month. Well a blood donation comes every other month for me but those viatimins have done the job. Last month I was at 14 something and on Thursday I was at 15 something. So, I looked at the Newspaper, briefly I think I mentioned and putting my new my improved work ethic at risk I decided to look at the funnies in the back. Well, I’m glad I did. I’m always pleased when I see two unrelated commics coincidentally cover the same idea on the same day. 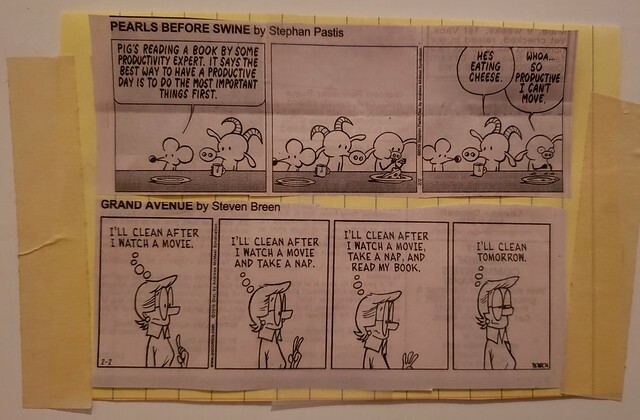 I clipped these two out and taped them to my wall. Fortuitously, they both reinforced my newly found dedication. I taped them to my office door. Its been two hours since I woke up and I haven’t yet attacked the floor. I did however get this written do the chores previously mentioned and am trying to bat some neglected work out of the way…..by doing it. Just before I began this I decided to act on the threat of losing my longest functioning formerly free photo sharing ap Flickr. For a month they had been sending me a warning that I was way over the 1000 picture limit. Unless I finally joined as a dues payer they would start deleting my uploaded photos. Gosh, I started relying on Flicker in 2006 when I first started the blog. I lost forty or fifty pictures of Denmark when my computer crashed years ago but I had uploaded a dozen of them to Flickr. I then used Flickr to post them on my blog for some color. They are still there. But. My pictures on these old posts will disappear if Flickr deletes them……so with that gun to my head I’ve started paying up. Well, that gets blogging out of my system for the day. On to that letter and on to my clean up.